‘What time shall we meet for dinner?’ We asked our newly met Ethiopian friends. We looked at each other completely confused, and from the blank looks on our faces, our new friend quickly realised that we had no idea what ‘Ethiopian Time’ was. And that's how we learnt that Ethiopia works on a different time, date, year and even calendar to the one we are used to. As Ethiopia is quite close to the equator, the length of the days does not vary that much throughout the year. As a result, they begin their day when sun comes up at 6am. For Ethiopians it is 0:00am, and their day is 6 hours earlier to our familiar times of the day. So at 10am western time, it is 4am Ethiopian time. To make it just a little bit more confusing, Ethiopian New Year begins on September 12th, there are 13 months and it is the year 2010 now! They have 12 months of 30 days and a 13th month with 5 or 6 days depending on whether it is a leap year or not. We couldn’t quite work out what the actual date was, but in regards to my time and calendar it is 4:35pm Friday 12th January, 2018 when I write this post, whereas it is 10:35am Friday January 4th, 2010 in Ethiopia. Confusing…but you can get used to it! We were pleasantly surprised to find the familiar Head & Shoulders shampoo on the shelves of a rather posh looking hairdresser shop near Meskel Square. It looked legit and even smelled the way it should, so we bought the bottle. Later that night, after feeling super excited about washing our hair with a ‘real’ shampoo, we quickly realised it was just a diluted bottle of some liquid! Addis Ababa is huge. Like, really HUGE. We were totally surprised just how far the city sprawled out. Did you know that there is a brand new train line that runs right through the middle of it? It even has two separate lines that run from the North to the South, and from the East to the West that intersect at Meskel Square! The tickets are ridiculously cheap (like 50c to get from one side of town to the other) and because the majority of the track is elevated 10m above the road, you get a pretty great view of the city. On one hand, the city is massive but it is still very much in the development stage. It's like one giant construction site. So many things are being built at this very moment, that from what we saw, Addis Ababa is destined to be a major hub of East Africa in the next decade or so. We knew little to nothing about Ethiopian food before arriving so we were curious to know what it’s all about. And it’s all about the injera. It’s seriously everything. We had it for breakfast, lunch, dinner and then last night’s dinner as breakfast the next day. Made from the tiniest grain, teff, it's a soft and slightly soured pancake. You tear off a piece and use it to scoop up whatever is accompanying the injera. We even had a couple of instances where the children had been given fake notes from adults asking people to pledge money so that their school can buy books for their library. Completely fake – and when we told the kids that we knew it was a fake letter, they were very embarrassed and quickly went back to what they were doing OR became angry with us and started to tease us or throw little rocks in our direction. Of course, this goes without saying, but always worth repeating – NEVER give money directly to anyone on the streets! There is a myriad of reasons why you shouldn’t, that we won’t discuss here, but just know that giving money sustains the begging cycle. If you feel so inclined to give something, then do your research and find a reputable charity that will actually put your money to good use. We feel that, if you purchase things from local farmers or local shops, then you are supporting the community in a positive way. Instead of buying your fruit from just one shop, spread it out over 3 or 4 sellers. Spread the money and show that you are willing to pay for things when people have actually earned it. We made the most rookie (and naïve) mistake when it comes to the weather in Addis and the rest of Ethiopia. Even though it has one of the hottest places on Earth, the rest of the country is quite mild and at some points, downright cold! Addis in particular never got above 25 degrees during the time we were there, and it was often about 10-12 degrees at night. And don’t get us started about how cold it was in the highlands of Lalibela – just check out our vlog and you’ll understand! 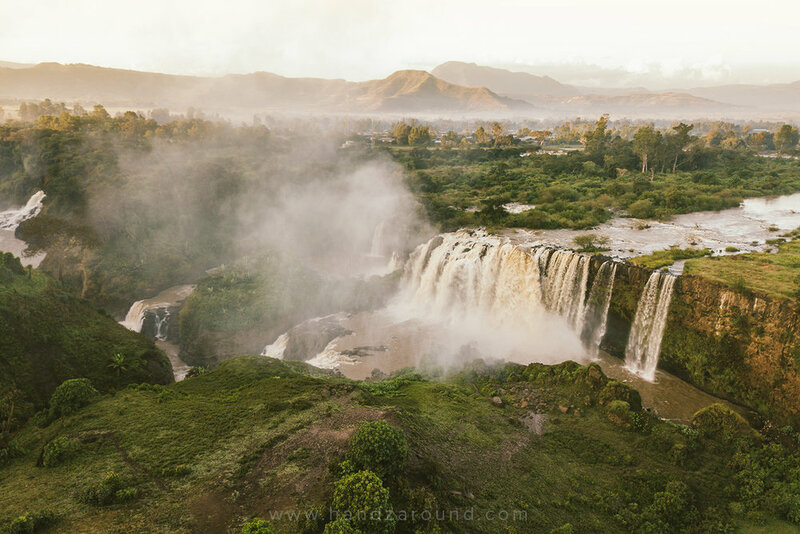 Ethiopia is definitely not the stereotypical image we had pictured in our heads. What we saw were sweeping green plains and lush vegetation in a lot of the places we went to. From the never-ending hills of Lalibela, to the desolate hell-hole of the Danakil Depression, Ethiopia’s ever changing landscapes are enough of a reason to visit the country. Eww…long bus rides! Nobody likes them, and if they say they do, they’re lying! We were totally dreading the idea of catching a BUS IN AFRICA. Especially after some of the horrid journeys we had had in Asia. But we are here to change the extremely common misconception. Ethiopia has an amazing fleet of comfortable, big and relatively new buses. There are routes all over the country covered by the three main companies – Selam Bus, Abay Bus and Sky Bus. Of course there are the dodgy buses that are usually shown in the media, but you certainly can get around the country without taking them (unless you're planning on crossing the border with Kenya overland!). Have you seen our 'Ethiopia' travel film?